Last night, our friends Jake and Karen took me with their family to one of their favorite restaurants in Singapore. 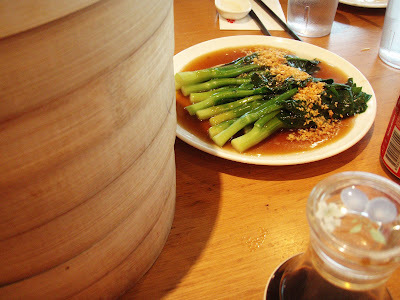 This is Din Tai Fung. It is nothing short of amazingly delicious. 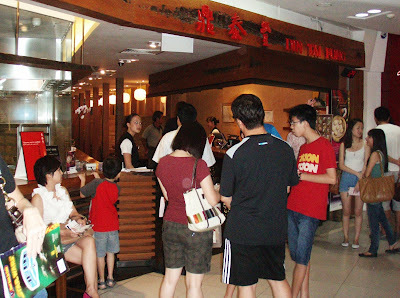 Din Tai Fung started in Taiwan by a Chinese man by the name of Yang Bingyi around 1980. It has since exploded in popularity and they have outlets in the United States, China, Japan, Singapore, Hong Kong, Indonesia and Korea. It was named one of the top 10 restaurants in the world by the New York Times in 1993. So yeah, it's good. Really really good. Their specialty is xiaolongbao — or what those of us unable to pronounce that word call "dumplings". These dumplings are technically "soup dumplings" because they are stuffed with a pork filling that contains a natural gelatin. This gelatin melts when the dumplings are steamed and becomes like a soup. Somehow the juice stays contained within the dumpling unless you're like me and accidentally poke it with your chopstick. If you're not a clutz, the dumpling is supposed to release the juices and meat when you bite into it. It's kind of like a mini soup surrounded by a thin dumpling shell. They are steamed in bamboo baskets and served stacked with the other five hundred you order. I'll admit that eating a dumpling was a bit jarring at first because I had no idea that it contained so much juice in there. When I ate my first (complete) dumpling, I almost felt like I was drowning because the liquid completely fills your mouth and goes down your throat if you're not ready. And I wasn't. I avoided a scene and somehow did not have a choking fit when the juice shot down the back of my throat. I think karma is being nice to me after previous events from the week. After that one though, I was good to go. They were so yummy. I ate like twelve of them. These are the dumpling makers in the back. 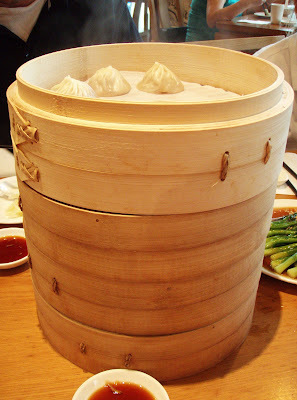 According to the Din Tai Fung website, they make each steam basket to order. Can I just say that I'm loving the fact that they're wearing masks? You don't see that a lot in food service over here. However, they're not wearing gloves. 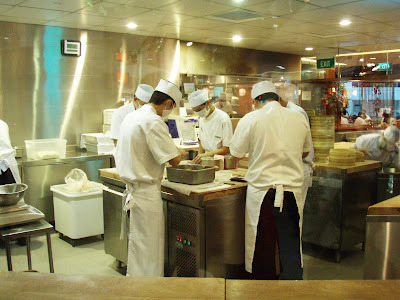 I'm sure they can't form the dumplings with gloves on, but I don't see gloves a lot in Singapore either. I have only seen gloves in Subway restaurants. I've learned to live without that food safety precaution. I just pretend they have invisible ones on. These are what I hear Singaporeans refer to as vegetables. Actually they call it "vegetable". They like to drop their "s"es and I'm trying to get over it. I really like these, but I have an issue with them. They're blanched so that the leaves are tender, but the stalks retain their rigidity. And they're almost always covered in a savory sauce. Here's the problem though: How am I supposed to pick the friggin' things up with my chopsticks if they're all slimed with sauce? It slides out of my chopsticks every time I try to pick it up off the plate. I've even tried the two hand approach with a soup spoon and my chopsticks, but it slips off the spoon too. This is another one of those times that I miss my fork. It's just so much easier to stab food sometimes. That issue aside, I love this place. I love it so much that I'm going to drag the hubs there as soon as he gets back. It might just be my new favorite place in Singapore. I'm sorry Pepper Lunch, you may get beat this time. It's one of our favorites too. We keep meaning to go to this place but never seem to make it in the door. Everything I've read / heard about the place is positive though so we need to stop messing around. I don't think we'll ever be in Los Angeles, so if we don't get to it in Singapore we might miss out entirely. Do you know there is a right way and a wrong way to hold chopsticks? The wrong way is where you hold it such that the chopsticks cross at the back (the end you don't use to kiap food). So when people use the chopsticks the wrong way, the food sometimes 'flips' out of the chopsticks. Not sure if you are holding it the right or wrong way, but people get by both ways. And it's not easy to change. But anyway, that place is awesome! But expensive.